It's been a long time since I've posted a recipe on here, wow where does the time go! It's not like I haven't been cooking, that's for sure, but I guess I've been slacking when it comes to taking note of measurements and taking photos to share with you. Sorry about that....but this one should make up for it! 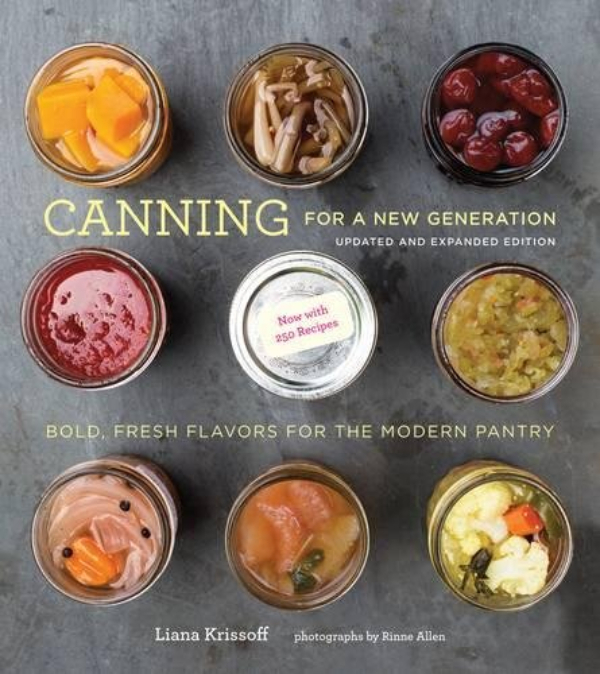 The first is called Canning For A New Generation and I'm very excited to experiment with some of these recipes! In addition to giving instructions and recipes on canning the author also gives recipes on what to do with these wonderful canned items when you break them out in the middle of winter. 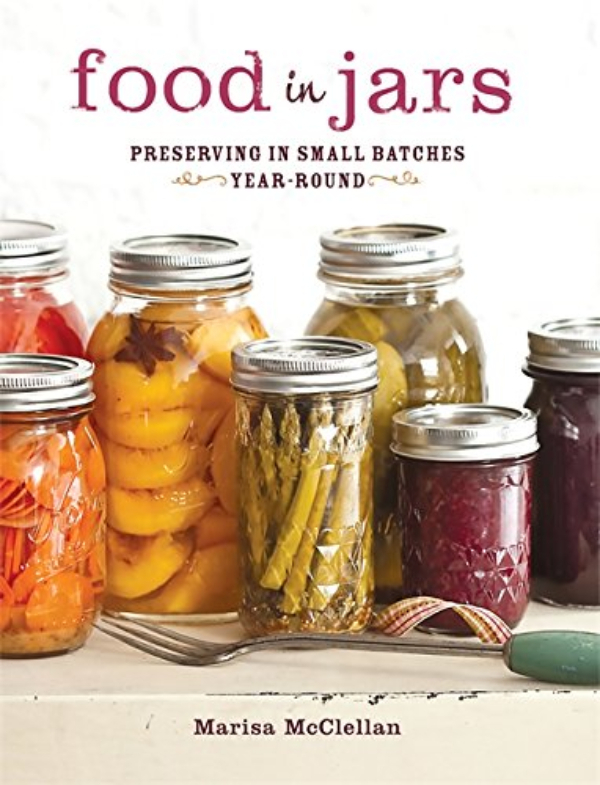 The second is Food in Jars, which I read about somewhere recently...I forget where, but when I looked it up on Amazon I immediately added it to my cart. I also have another book I bought years ago, the Ball Complete Book Of Home Preserving. I refer to this as well as online searches, but I am looking to expand my library and my knowledge, so I'm hoping the new books will help with that. Plus I'm a very visual person, and I prefer my cookbooks to have a million awesome pictures. This book has some great photos, but not enough for my tastes. When I went to the market over the weekend they were having a sale on pineapples and mangoes. I took home one pineapple and three mangoes and started looking up recipes to preserve them for winter. I decided I was going to make a chutney. I absolutely love a nice spoonful of chutney with roast chicken or pork, or on a grilled ham and cheddar sandwich. I researched the basics and decided I knew enough to get started. I started by gathering my ingredients....and remembering to take a photo for you! 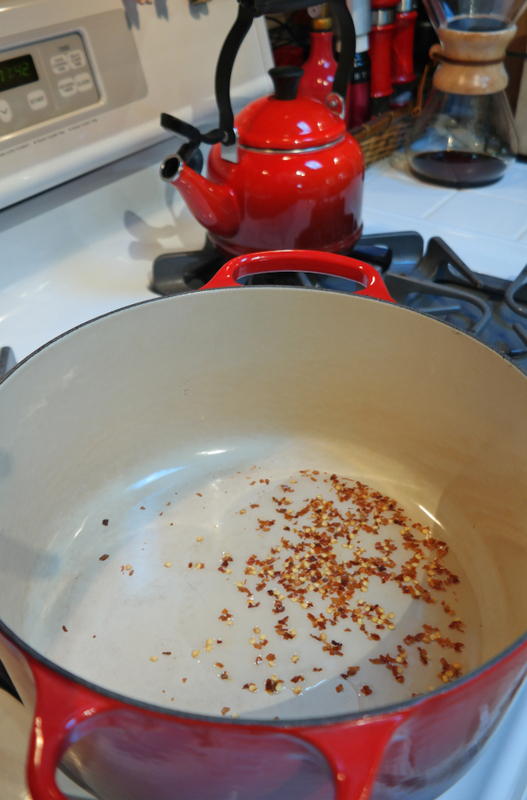 I heated up my favorite red pot on medium, and got out the canola oil. Generally I cook with olive oil, but I wanted a milder oil for this recipe. I put a teaspoon of crushed red pepper into the hot oil, and waited for it to start sizzling. While I was waiting, I started chopping. 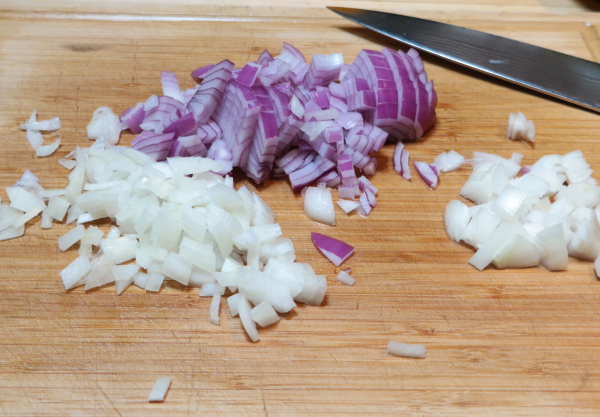 One medium sized red onion and one small yellow cooking onion, diced. When the red pepper flakes were sizzling, I threw in the diced onion and turned the heat to low. I put the lid on, and stirred frequently until the onions were translucent and soft. I didn't want them to brown, as I read that would make the chutney bitter. Next went in a diced yellow pepper. I gave it a few minutes to soften as well before adding in the diced pineapple and three diced mangoes. Everything got a good stir, and I kept it on low for now while I kept dicing. 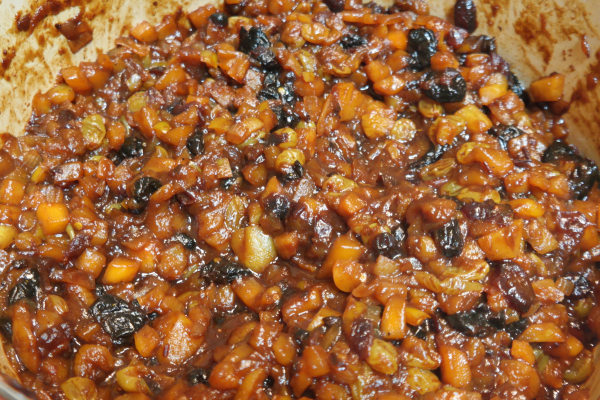 I decided to add some dried fruits - a cup of golden raisins, a cup of diced dried apricots, a cup of dried cranberries, and a cup of dried cherries. You can experiment with what you have on hand, the recipe is quite adaptable. When I had everything in the pot, I turned the heat to medium and added a half cup of apple cider vinegar and a cup of water. I brought it to a boil, and turned it back to low again. Next came the spices. Again, you can experiment with spices you have on hand, just keep in mind you want warm spices such as ginger, cinnamon, clove, allspice, etc. I put in a half teaspoon each of cinnamon, cardamom, ginger, allspice, and ground cloves. I also added 1 1/2 tablespoons of curry powder, and a half cup of brown sugar. Everything got a good stir, and the lid went back on. I stirred frequently as I did not want the chutney to scorch. 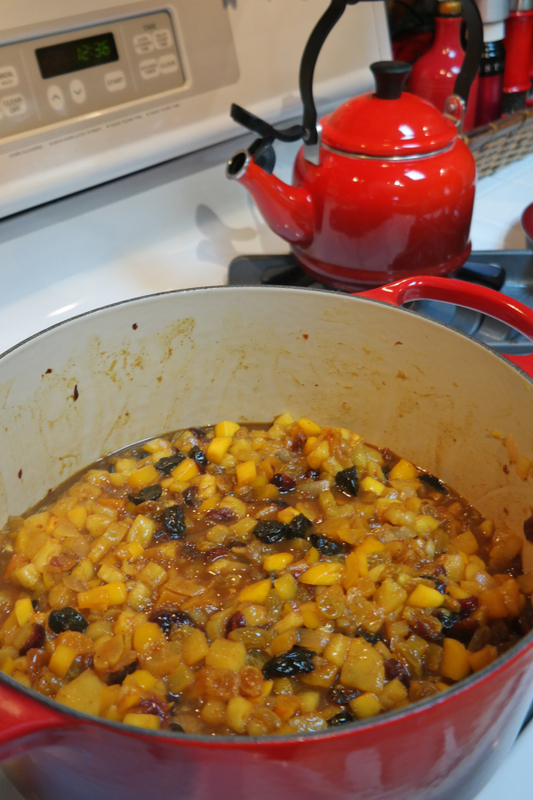 After a half hour or so, I took the lid off and let the chutney simmer for another hour, again stirring quite frequently. The smell in my house was heavenly, I'm surprised Mr. Bear didn't come knocking! After the liquid had reduced down and the chutney became 'jammy' I knew it was done. Oh my gosh, I couldn't wait to sample this! I filled four pint jars with my amazing chutney leaving a half inch head-space and processed them in a water bath for about 20 minutes. I kept out a small amount to sample with our roast chicken that evening, and let me tell you something it did not disappoint! As for the roast chicken, I have never veered from my recipe for the Most Amazing Chicken Ever since I posted it way back when. It never, ever disappoints! At this time of year, I finish it on the grill...in winter I finish it in a hot pan. It's always incredible, my mouth is watering just thinking of it now! The chutney was the absolutely perfect accompaniment for the tender, juicy chicken....yummm!! 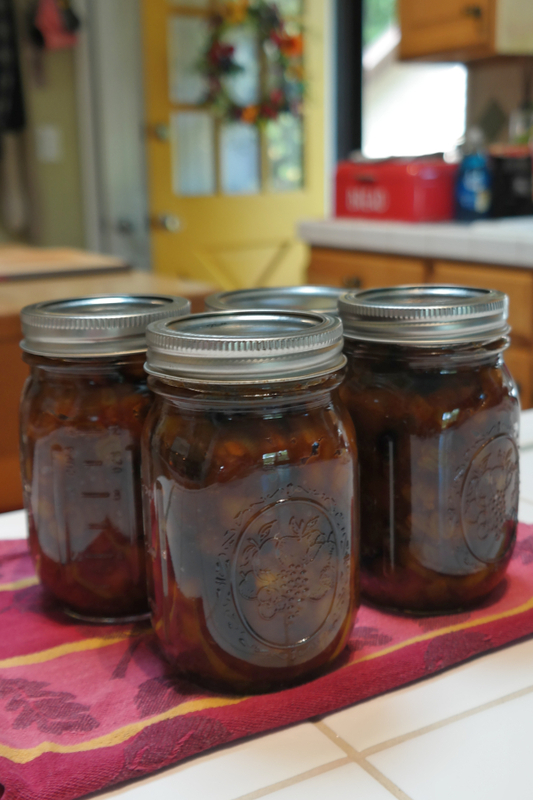 I'm so excited to have four jars of this fabulous chutney to enjoy all winter long! Yes, this was a pretty labor intensive recipe, and I was standing in my kitchen for a very, very long time that day. But it will all be worth it when I reach into my cupboard in the midst of winter and pull out a jar of homemade chutney to serve with a nice roast chicken or pork dish. While I was cooking the chutney, I processed some other produce that we had harvested out of the garden during the week. 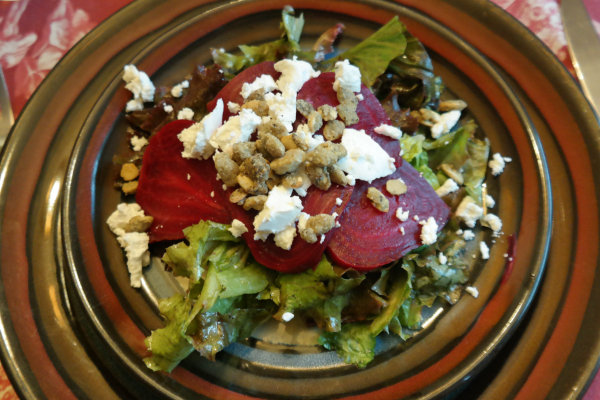 We've been eating roasted beets on our salads regularly - my sweetie absolutely loves roasted beets. I slow roast beets on low for 8 hours in my crock pot, drizzled with olive oil and tucked into a foil pouch. When they are cool, the skins slip right off and they are ready to slice and freeze. 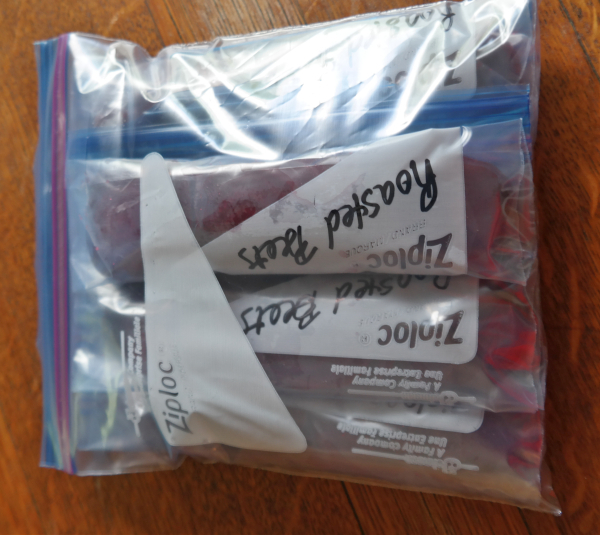 I popped five little bags of sliced, roasted beets into a larger bag and put them out in the stand up freezer in my garage. The beet greens were sliced and put into the freezer as well, to add to soups in the winter months. The green, wax, and purple beans were trimmed and frozen in meal sized portions as well. 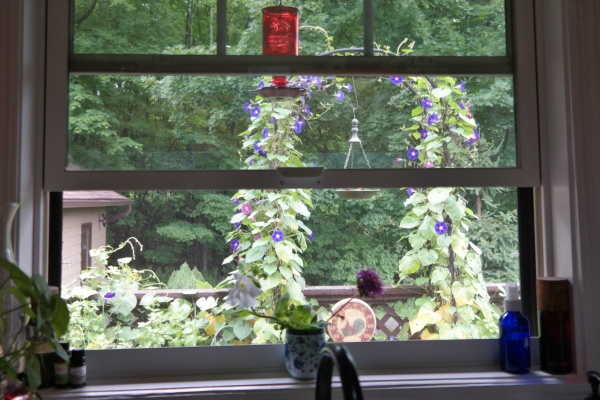 It was a long day in the kitchen, no doubt, but the view out my kitchen window over the sink made it quite enjoyable. 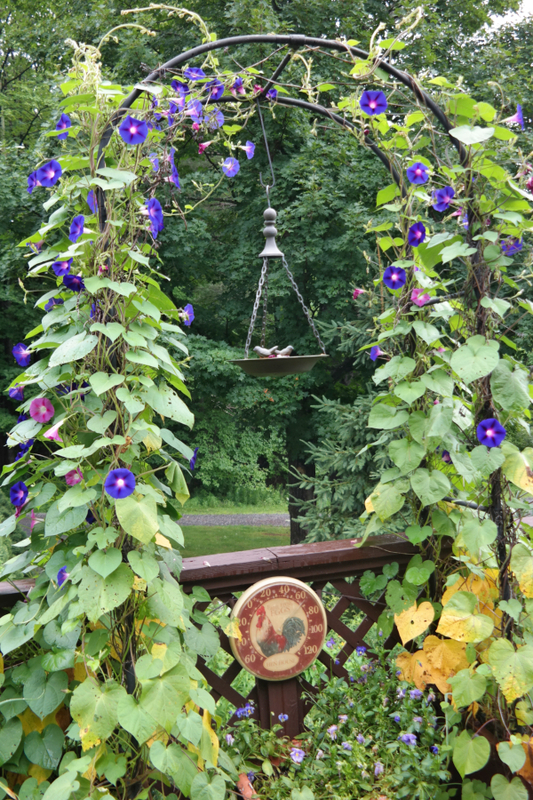 I absolutely love this time of year when the Morning Glories are in full bloom! Isn't that just the most glorious sight? I haven't planted any Morning Glories in a few years...I planted them the first year I was here and they just keep re-seeding in my herb boxes! I weed out the ones I don't want and leave the rest to grow like mad on the arch and fence. Meanwhile where were my helpers during my long day in the kitchen? Little Miss Molly was napping in my daughter's room, while Monkey and her mommy snuggled up together on one of the living room chairs. That chutney sounds great! I haven't ever canned. My mom did. I don't have a big enough garden to can, but maybe I might start hitting some farmers markets....hmmmm. I have been freezing a ton of stuff every year, Penny, in the form of sauces and soups as well as washed and trimmed veggies. I did can some pears once years back, but never anything other than that until now. Last year I made pickles and pickled radishes, but they were refrigerator pickles so didn't need to be heat processed. I might stick with them again this year as the heat sealing can make pickles less crisp, to my understanding...there's so much to learn about preserving food! Oh man! I have never heard of Chutney but it looks so good! I would love to find a jar of it to try. Is this something that I could find at a farmers market? It's amazing, Lisa, you'd love it. You can get it in any good gourmet store, and some supermarkets carry it as well. You might find it with the Indian foods. 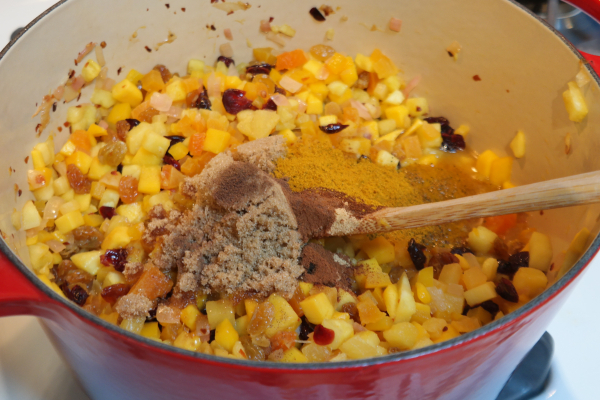 Major Grey's Chutney is the most commonly found, and it'd delicious, also mango based. Hi Mountain Sister!!! I'm sorry I haven't been around much to see what you've been up to. Life has been crazy lately. I started canning a couple of years ago mainly because I needed to learn how to make my mama's sweet pickles. I enjoy it and wish I had more time and a garden to do more. Maybe one day. I love this recipe. The spices involved sound amazing! Enjoy your summer while you can, girl! p.s. 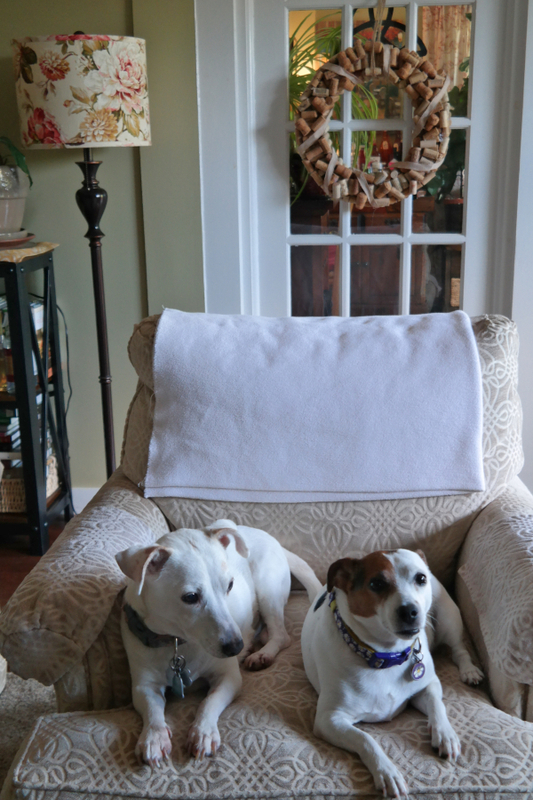 I love the cork wreath behind your sweet doggies! Hi Mountain Sister! No need to apologize, I know you work full time like I do....it can be tough to get around blogland at certain times when life gets crazy! My daughter made me that wreath for Christmas...isn't it lovely? I love canning, but have gotten lazy about it last year and this. Blueberry Lime jam was my favorite item. This year I'm just making and freezing pesto from basil in the garden and buying other peoples jarred goods. I buy other peoples jarred goods also, Karen Ann, don't get me wrong! Mmmmmm blueberry lime jam sounds amazing, how refreshing that must be! I love chutney but have never made it. Yours looks SO good! I don't know what possessed me Ann Marie, but I'm sure glad I tackled it! I'm kind of proud of myself!! 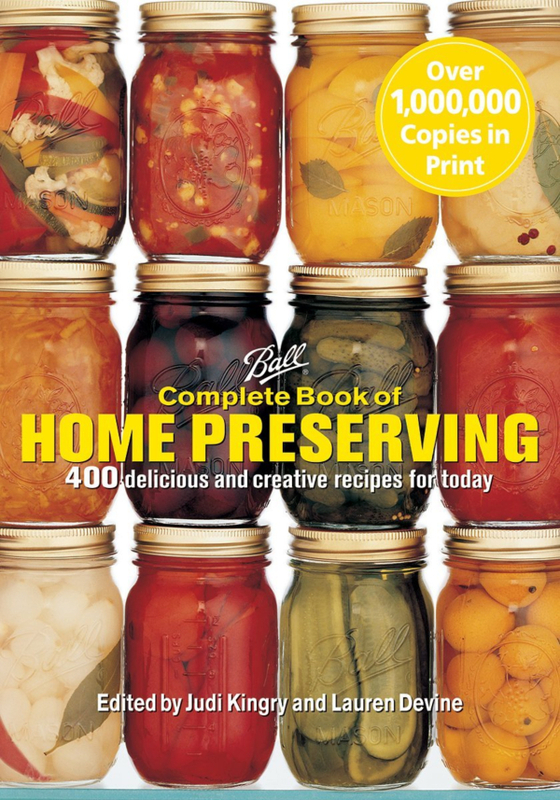 The Ball canning book was my bible when I first started canning decades ago but more pictures would have helped a lot. I don't think I ever made chutney but I bet it will be wonderful, and all without that little bit of a chemical taste that grocery store chutneys have. I know your kitchen must have smelled marvelous by the end of the day of cooking! And you did have a pretty picture through your window with the morning glory arch! I started on my canning quest because of all the zucchinis we typically get out of the garden, Dewena. I saw a recipe somewhere for a zucchini relish and I thought my sweetie would love it...and I figured I should learn how to can it! I also want to make my own salsas this year! Molly and Monkey are too adorable. So sweet to see them here today. It is great you are canning so you can have all this yummy stuff come winter. I use to make jam some years ago but that is about as close to canning I ever got. You go girl this all looks so good. I wish I had more fruit on my property to be able to take advantage of making jams, Kris - I planted a blueberry bush, a raspberry bush, black and red currant bushes, and strawberries and I'm lucky if the birds let me have just a few berries out of all that! I'm actually allergic to avocados, Melanie, so I'm going to have to avoid that oil, but thanks for the tip! I generally use extra virgin olive oil, the canola oil is just a backup! This chutney looks amazing! 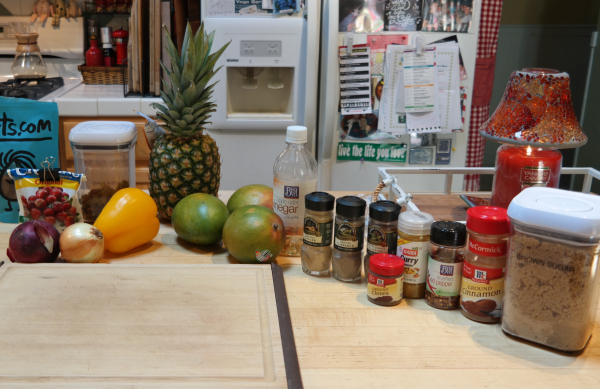 I have made mango chutney in the past, but never paired it with pineapple. I think chutney is really underappreciated in this country. It's not just for pairing with Indian food (I keep assuring people), but an excellent relish that pairs with so many things. Thanks for the recipe! Absolutely, Pattie! I'm thinking I might also serve it with a Christmas ham this year!! Usually I make an Irish Parsley Sauce for ham....hey maybe I'll make both! I do wish I had more time to put up even more stuff, but I try to do as much as I can to preserve what we work so hard to grow, Nancy! That sounds so good and I'm so impressed with your canning plans. I am personally addicted to peach salsa. I'd be happy to get all of my fruit in a salsa/chutney form! Yum, peach salsa is awesome, Jen! I'm going to attempt to make salsas this year also, once the tomatoes start overwhelming me!